At Baskets By Donna, your satisfaction always comes first! Here is what our clients had to say. “The first time I met Donna was out at Boscov's at the Granite Run Mall in Media, Pa. I was shopping and walked past a stand that she had set up displaying all of her baskets. I asked her for her business card and that is how I started purchasing baskets from Donna. I have used her baskets for Birthdays, Showers, Engagements, Weddings, and Get Well. Each gift basket that Donna made up for me was very personal - just for the person I was buying it for. Donna always communicated with me by e-mail of what I expected and asked me a little about the person and their likes. We would go back and forth with our ideas. We always worked together as a team. Donna does not just "make baskets" - she designs them with thought, love and kindness. She goes out of her way to make each of her baskets so special. Everyone that has received them as a gift have been amazed at them. “Donna has done a number of Holiday gift baskets for our office. We were very pleased with the effort she takes to make each one special and all the baskets were delivered on time. On a personal note, Donna has done a demonstration of her basket technique for the members of my local cooking club, as well as at a local department store. She willing shares tips and ideas for gifts that anyone can make. 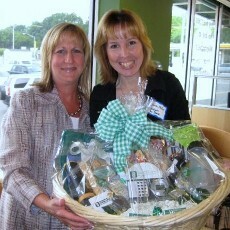 Donna Mallon (Owner of Baskets by Donna, right) presents Lisa Dort with a basket.